Understanding the dramatic political, social, and economic changes that have taken place in Poland in the mid-1980s is one key to predicting the future of the communist bloc. Jadwiga Staniszkis, an influential, internationally known expert on contemporary trends in Eastern Europe, provides an insider's analysis that deserves the attention of all scholars interested in the region. 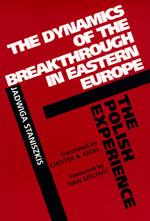 Staniszkis presents the breakthrough of 1989 as a consequence not only of systemic contradictions within socialism but also of a series of chance events. These events include unique historical circumstances such as the emergence of the "globalist" faction in Mosow, with its new, world-system perception of crisis, and the discovery of the round-table technique as a productive ritual of communication, imitated all over Eastern Europe. After describing the development, collapse, and reorganization of a "new center" in Poland in 1989-1990, she discusses the first attempt at privatizing the economy. Her analysis of the dilemmas accompanying breakthrough and transition is an invaluable guide to the challenges that face both capitalism and democracy in Eastern Europe. Jadwiga Staniszkis, author of Poland: Self-Limiting Revolution (Princeton 1986) and Ontology of Socialism (forthcoming from Oxford), resides in Warsaw, where she is a docent (associate professor) at Warsaw University's Institute of Sociology. Chester A. Kisiel is a professional translator living in Warsaw.